Yosemite National Park is a photographer’s haven, a masterpiece in stone full of classic scenes and intimate landscapes. Come join William Neill, author and photographer of William Neill’s Yosemite Volume One, and photographer of Yosemite: The Promise of Wildness for a private workshop in Yosemite National Park. William is also a long-time contributor to Outdoor Photographer magazine for the past 15 years in his regular On Landscape column. He has lived in or next to the park for 35 years, and he will share with you his extensive knowledge, experience and philosophy on photography and Yosemite. William is know for his unique imagery of the park. "Your session with me will be personalized for your individual needs, whether you are a beginner or an advanced photographer. The focus will be on developing your personal perspective with instruction on both technique as well as how to develop your vision as an artist. I worked at The Ansel Adams Gallery as staff photographer for five years while Ansel was alive, during which time I was strongly influenced by Ansel and the photographers surrounding him. I will share stories from knowing Ansel, and other inspirational photographers that guide my photographs." Available locations include Yosemite Valley, the Yosemite High Country along the Tioga Pass area, as well as Glacier Point and the Mariposa Grove, or the Oakhurst/Bass Lake area. Trips into the field will be planned for the best possible lighting and weather, while considering seasonal issues such as storms (or lack of! ), or road closures. Your opportunities will be maximized. Depending on the weather and lighting, mid-day time will be used for downloading image files, review and critiques of new photos, and technique assessments. Field sessions can be combined with Neill's One-On-One Private Studio Sessions, which can include sessions following or prior to field sessions. Contact me by email with your preferred date or dates, and with your interests and expectations for the workshop. The details will be coordinated to accomodate both student and teacher's schedule, lodging availability, etc. Lodging and transportation to the workshop location will be the responsibility of the student or students. While you will need to arrange transportation to and from the area, William will provide transportation to the various photo locations. The basic fee is $800 for one student for one full day. See the chart below for other possible combinations for extra days and additional students. Payment by credit card, check or PayPal. A deposit of $100 will reserve your session. See "Add To Cart" at the top right. Contact me with any questions you may have about my Yosemite Field Sessions. "I also offer fine art print viewing in my living room gallery. I will discuss my photographic prints from both an artistic and technical viewpoint. It will greatly benefit you to see actual, gallery-quality photographs, in order to learn how to make your photographs better, and realize your vision through the fine art print. You will also be able to view my latest prints and one of a kind prints not normally available. If a particular image interests you, please advise me in advance so that you can see a “review” print." "During the past thirty two years of my career, I have always taught photography whether at major workshop programs around the country, through my Outdoor Photographer column, On Landscape, or online through BetterPhoto.com. Inspired by Ansel Adams when I worked at his Gallery in Yosemite, I learned from him the great importance of sharing knowledge and giving back to the art of photography." contact me here about available dates today! $100 deposit required. Click on "Add To Cart" to reserve your session. Full payment will needed two weeks prior to session date. Deposit is refundable upon cancelation if two weeks before session date or due to extenuating circumstances. If you have questions, contact me. Reduced rates are available to small groups, so gather some photo buddies together and meet me in Yosemite! Call or email for questions! Learn how to create "light paintings" with intentional camera movement. William will domonstrate how he creates his Impressions of Light" photographs, and guide you with your efforts in the field. "The Workshop was extremely helpful to me, and was an excellent value. 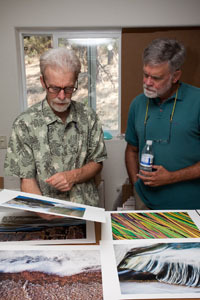 Bill is a terrific teacher, and I learned much from the critique of my prints. I learned how to better-evaluate my work, both from artistic and technical standpoints, and Bill taught me how to identify the small improvements that would help my work reach the next level. Bill is a gracious host, patient and practical teacher, and a great guy. I look forward to doing another Workshop in the future. Highly recommended!"